An area at the Mount Mawson ski tow in Mount Field National Park had undergone some heavy earthworks in 2013 or early 2014 as part of slope grooming. It was then sown with alpine grass seed with some success and covered in a loose hessian. Naturally growth is slow at this 1200m altitude and animal grazing was also taking a toll on the herbs and grasses. Satisfactory recovery looked likely to be very drawn out. 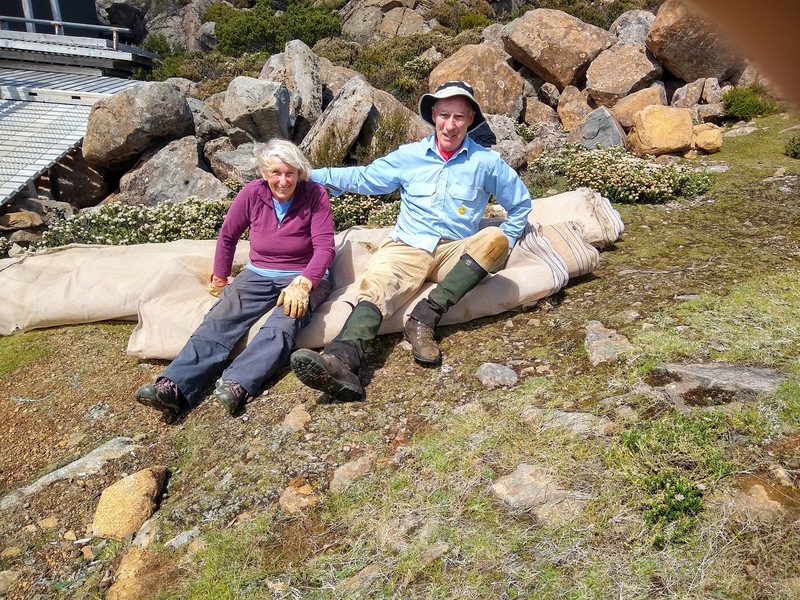 The FOMF obtained a Wildcare grant laying out and pinning approximately 700 sqm of shadecloth on this alpine area to speed up revegetation. This was put down in February 2016 and now 3 years later is was taken up to reveal a lush green grassy slope. Small plants such as Pimelea were also growing in numbers. Pins that held the cloth in place were plentiful and took some discovery and effort to prise from the earth. Surprisingly it was the task of rolling the cloth up that was the hardest part physically. The old Rodway Hut site has been under observation for several years as it is scar on the landscape that ought not be there. It is said to have had rehabilitation attempts made but without success. 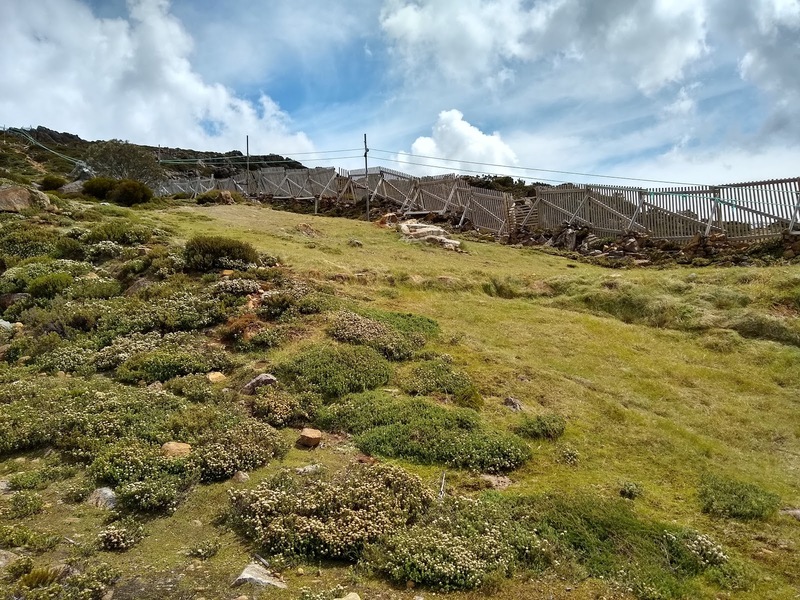 The removal of the shadecloth on the nearby Mawson ski slope rehabilitation project, provided the opportunity to use some of the shadecloth in an attempt to rehabilitate the hut site. Some of the cloth and pins were taken there and placed over the bare ground. In a few spots holes were cut for some of the very few plants that had established on the site. Not quite enough shadecloth was brought along and that left a small bare area remaining; however on returning to base a portion was collected for use on another day. Being close to the new Rodway Hut we called in there and were surprised that someone had marked a route going behind the hut through the very wet and muddy areas and down through an area of soft ground that even now was very wet. Whilst at the hut we were asked by two walkers where the track to the Tarn Shelf went. This question also arose from some people last time we were at the hut and other walkers have mentioned the confusion at this point. Our conclusion is that the boardwalk gives people the impression it is just for the purposes of getting to the ski tow hut, rather than the track to Tarn Shelf. Three poles were put in to help make it clearer. We also think the boardwalk leading behind the Rodway hut has caused people to assume that is where the track went and in our opinion it ought to be removed.